In most jurisdictions, CEAS must be "activated" by government in order for credentials to be valid. In the Commonwealth of Massachusetts and State of Rhode Island, CEAS does not require government "activation" as the program as credentials are considered valid at all times. Governments may declare an Access Level in order to limit access. The matrix below is a guide to what credentials are valid for use during a specific Level Declaration. The individual cardholders ability to travel or access an area is based on the "Access Level" printed on the face of each card. See the example below. Note: Your organization's access Level is determined by industry type, not individual cardholder. ALL company cards are issued with the same Access Level. Important Information About Level "X" : This Level of access is denoted primarily for the purpose of informing organizations that the program is either inactive or the situation dictates that area is off limits to everyone but public safety personnel. Note: As CEAS is considered in an "always on" state in Massachusetts and Rhode Island, these State programs do not use Level "X". 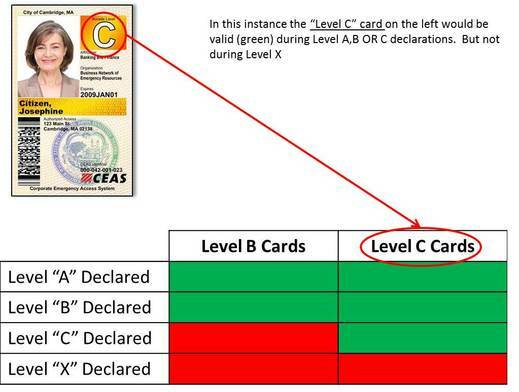 Important Information about Level "A": If Level 'A" has been activated due to ongoing travel restrictions, then ALL CEAS cardholders are authorized (green) to travel.